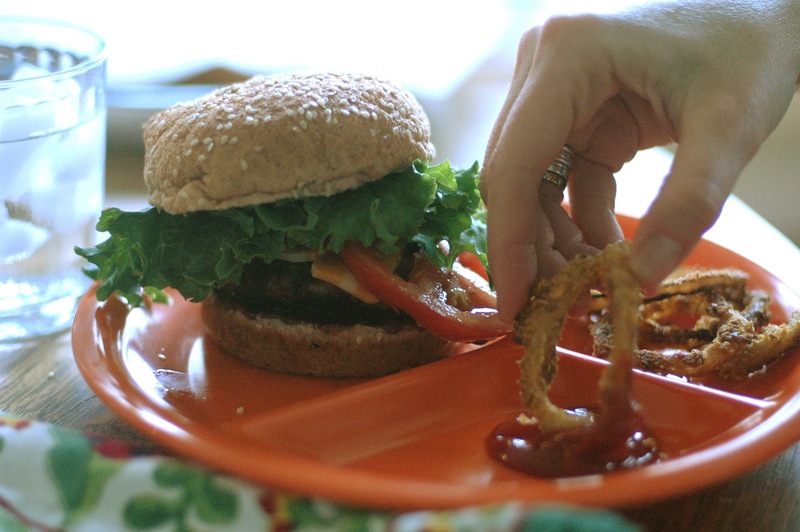 In 1991, the spring of my freshman year of college, I had a memorable encounter with onion rings and baby back ribs. I was thrilled to be asked out on dates with guys in college, as this dating thing was a new experience for me. I was invited to dinner by this guy that I had become acquainted with at school. He was a nice guy and I was happy that he wanted to take me out. When he picked me up he said he wanted to take me to Tony Roma’s (a Ribs Restaurant) because it was his favorite. I had never been there and actually I had never had ribs. I had tasted a bite of my dad’s before, but I had certainly never ordered them at a restaurant. I’m not really a ribs kinda gal. The restaurant is a sit-down, glassware and cloth napkin kind of an establishment. My date said, “You have to order ribs. It’s my treat and I insist!” As I looked at the menu I became a little overwhelmed with the rib options. I told him I didn’t know what kind to order and he advised me to order the baby back ribs. I followed his suggestion. He also said that we must order an onion ring loaf to share. I agreed. I had experience with onion ring eating. The onion loaf came as an appetizer and it was delicious. Crispy and thin, salty and savory. I dug in! I realized that this is not the most polite, lovely, feminine food to eat and that I didn’t quite know what I was doing. So, I just watched him eat his first rib, and I tried to replicate his technique. This went okay. I certainly was making a mess of my face and hands, but really enjoying the meal. (I am already a pretty messy eater and use a lot of napkins). I couldn’t tell you a thing we talked about, for I was too focused on eating the ribs correctly and not embarrassing myself. It began to dawn on me that I better speed up my eating because there was a good chance that he would finish his food before me (as men often do) and then he would WATCH me eat the rest of my ribs. My parents diligently taught me to not waste food, and therefore I felt like it was appropriate to clean my plate – especially when someone else was paying for it. So, with this dilemma swirling in my head, I decided to switch it into high gear and pick up the pace. I ate and ate and discreetly licked my fingers, and piled bones on the “discard stack” until I looked up and realized that I had eaten my entire platter of food and he still had half of his meal yet to be eaten. Interestingly (and perhaps not so surprising) he never asked me out again. I don’t think we were each other’s type anyway. And I have actually never ordered ribs again. However, I have eaten many, many onion rings since then. I really, really like them. I have never, though, made onion rings. I think I was intimidated by them as I don’t have a deep fryer and don’t like to make fried food at home, and I couldn’t imagine they would be any good baked. But now I know it’s possible! Everyone in my house likes onions. A lot. Therefore everyone loves onion rings! As far as eating onion rings out at a restaurant, there is quite the variety of onion ring quality. I love an onion ring loaf, though it’s hard to find probably because I like thin and crispy ones, and I like for them to not be so densely breaded. I pulled this recipe from Martha Stewart’s Everyday Food magazine years ago in the “Eat Smart- Healthy Toolbox section” and have had it in my notebook to try. I saw them the other day and was driven to go buy the ingredients and make them, along with some Turkey Burgers. They are baked, not fried (healthier and less messy). They are really, really delicious! Preheat oven to 450˚. In a food processor, pulse cornflakes and breadcrumbs until fine crumbs form, then transfer to a medium bowl. 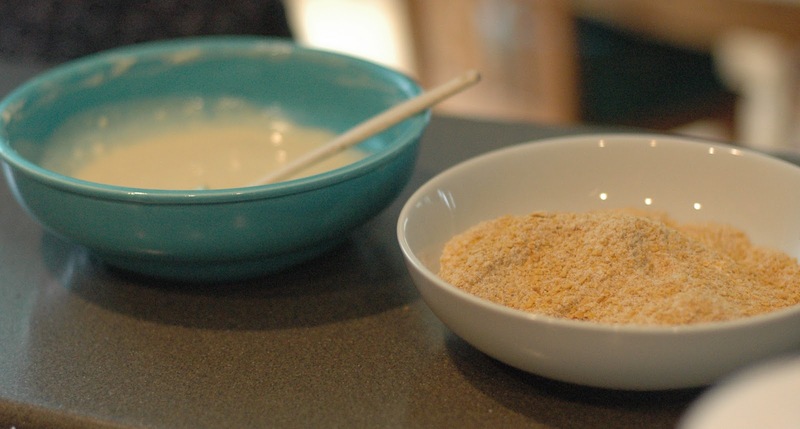 In another medium bowl, whisk together egg, buttermilk, flour, and cayenne and season with salt and pepper. 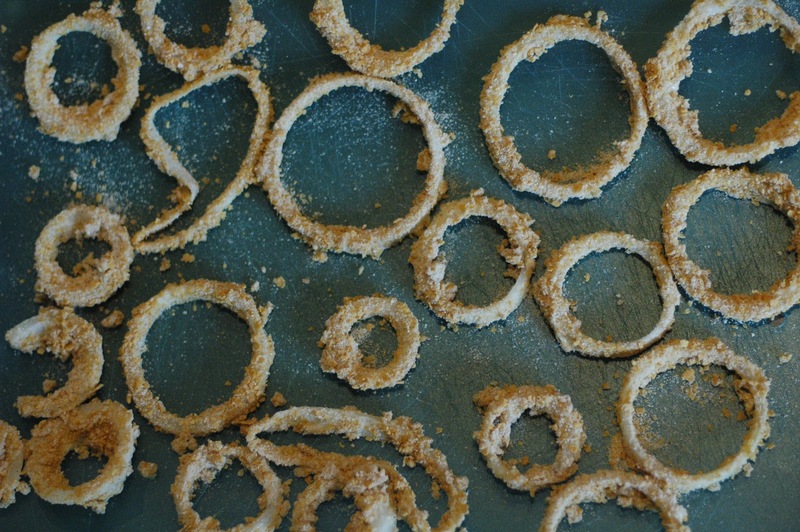 Dip onion rings into egg mixture (letting excess drip off) and dredge in crumb mixture; place on a large plate or tray. 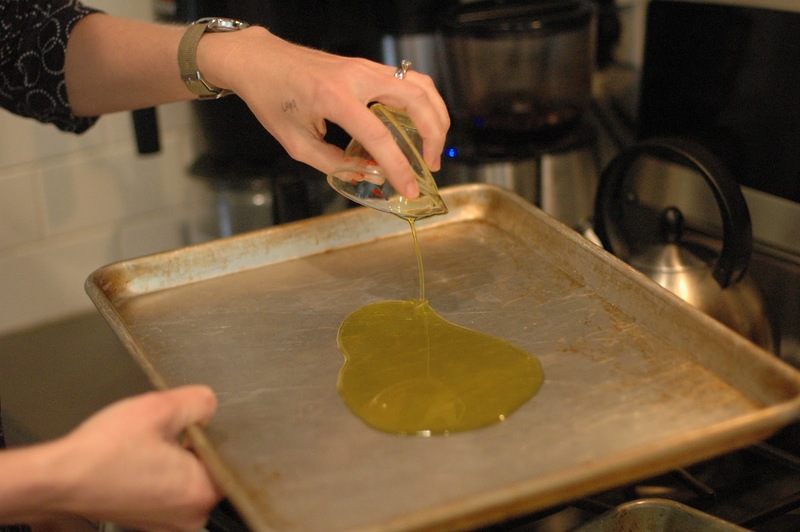 Pour oil onto a rimmed baking sheet. Place in oven and heat 2 minutes. 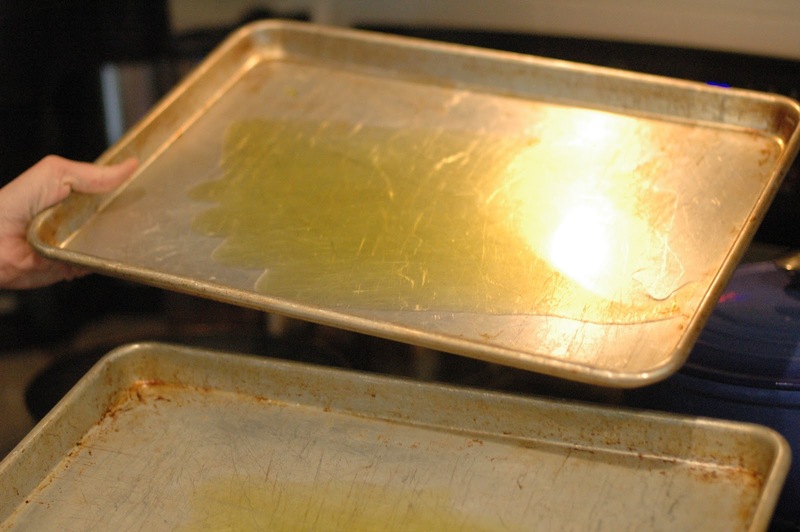 Remove sheet from oven and tilt to coat evenly with oil. Arrange onion rings on sheet. 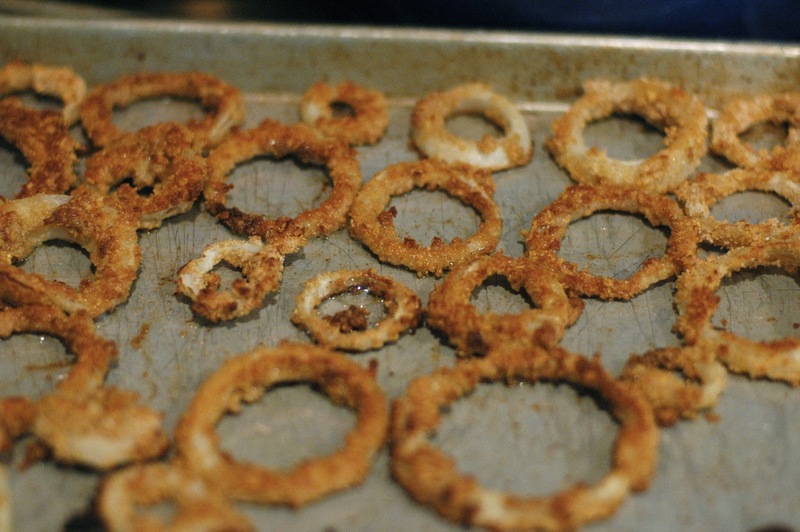 Bake, turning once, until onion rings are golden brown, about 15 minutes. Place on a paper towel lined plate and season with salt. My “take aways” are: don’t eat ribs on a first date, do try these onion rings and set aside some of the crumb mixture so it doesn’t get all gummy, and accept the reality that messy rib-eating can’t make or break a relationship. If it’s not “meant to be” it’s not meant to be. Oh, Julie-this is too funny! What a great story! 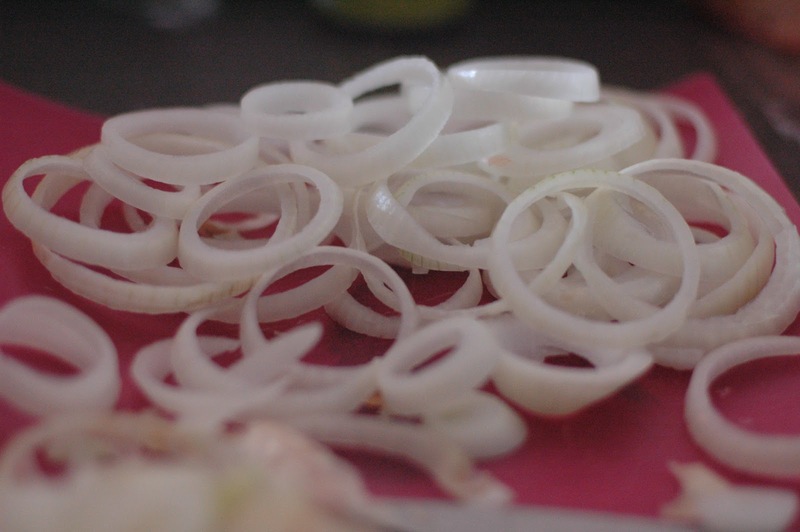 I'm afraid if I were to make these onions, I would be alone eating them, and consequently, eat the whole plate. They look so good!